A Sign of the Times High-end Pinot Noir producers, Loring Wine Company and Pali Wine Company, who share a winery in Lompoc, have released appellation wines with the 2008 vintage to compliment their series of vineyard-designate wines. Part of the reason is the growing season in 2008 produced marked variation in quality within vineyards and part of the reason is that at this time the cash-strapped consumer deserves some less expensive but good Pinot Noir from respected producers. Loring Wine Company has released a Russian River Valley Pinot Noir and a Central Coast Pinot Noir priced at $24 a bottle (retail is $33) for mailing list members when purchased by the case ($288) including shipping. The two appellation bottlings may be mixed (6 bottles of each). Pali Wine Company (whose winemaker is also Brian Loring) will also be releasing appellation wines for the first time. The wines may be tasted Thursday through Saturday 11:00 to 4:00 and Monday through Wednesday by appointment. 818-681-4803 (Loring). San Francisco Restaurants Contribute to Northern California Wines Each day, the scraps from San Francisco’s most famous restaurants are sent to a compost facility in Vacaville in Northern California owned by Recology. The food scraps are transformed into rich, brown compost that is then used in some of the most recognized vineyards in Napa and Sonoma. Also, the compost spread in the vineyard helps ground cover to thrive which in turn fights global warming. American Drinking Habits According to the latest Harris Poll®, 56% of women drink domestic wine compared to 43% of men. On the other hand, 31% of men drink foreign wine versus 26% of women. Men are more likely to drink alcohol at least once at week than women (40% versus 19%) and more Millenials (those aged 18-32) drink at least once a week than Gen Xers (those aged 33-44). Democrats and independents are more likely to drink once a week than Republicans. Lightweight Wine Bottles Boisset Family Estates, in partnership with JW Marriott Hotels, has launched Fog Mountain, the first California wine in 1-liter PET (polyethylene) plastic bottles by EnVino Bottles. The first wine will be a Merlot sourced from several growing areas within California. Boisset is a world leader in PET wine bottle packaging. They shipped their entire 2008 Beaujolais Nouveau in PET bottles and bottled the first AOC wines from the Côtes du Rhone in the lightweight bottle style. The advantage to the PET bottles is reduced shipping weight, less energy consumed in transit and production and less carbon footprint of every case shipped. The bottles are recyclable, shatterproof, closed with a screw cap and do not impact wine quality. Australia is becoming a large producer of lightweight glas wine bottles. Glass container giant OI is producing bottles that weight between 18 and 28% less than conventional bottles. I love to see this trend. Ethics of Wine Writers Questioned Although Robert Parker,Jr. has historically maintained a strict code of ethics for the Wine Advocate, the integrity of some of the writers for this wine journal has been recently called into question. Reportedly, writers from the Wine Advocate have had travel expenses paid in recent years by trade and industry groups as well as partaken in lavish wine dinners and vacations fronted by wine importers whose wines are reviewed in the Wine Advocate. Robert Parker,Jr. has not been implicated and he claims no bias has occurred. To clarify my situation on this matter, I have never received payment for travel, lodging, and meals from any winery I have visited. I have on occasion received courtesy lodging at wineries with guest houses when attending Pinot Noir related events or traveling to report on wine regions. I have been hosted at a few winemaker dinners that were sponsored by public relation firms hired by wineries. Finally, I have had expenses paid to attend major Pinot Noir Festivals as media (Salud and IPNC in Oregon, for example). In the vast majority of trips, I pay my own way. I also continue to purchase a majority of the wines I review but do accept samples. I take purposeful integrity very seriously and strive at all costs to retain my reader’s trust. Lynmar Estate Pinot & Pizza Saturdays Hand-crafted artisan pizzas prepared with native winery yeasts, home-cooked marinara and pesto sauces from estate-grown heirloom tomatoes and ten varieties of basil. Vegetables, herbs and edible flowers are plucked from Lynmar’s estate gardens. Local artisan cheeses and meats are used. 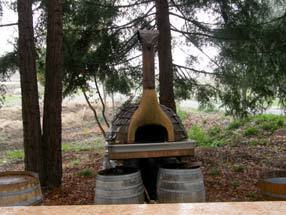 The pizzas are assembled by resident Chef Sandra Simile and cooked outdoors in a wood-burning oven. The pizzas are paired with Lynmar Estate limited-release Pinot Noirs. Future dates include June 13, July 11, August 1, and September 12 from 4:30 to 6:30. Price is $55 ($40 for Advocates Club Members). 707-829-3374. Oregon Certified Sustainable Wine Program In keeping with the spirit of Earth Day, the Oregon Sustainable Wine (OCSW) program was launched at www.ocsw.org on April 22, 2009. The site is part of a movement to help consumers understand sustainable farming and winemaking, from vine to bottle. Green minded consumers who are looking to put their dollars towards supporting their ideals will find the site useful for finding OCSW wines and learning more about the program and the wineries involved. Stephen Ross Wine Cellars Relocates Stephen Ross, an accomplished producer of Central Coast vineyard-designated Pinot Noir, relocated their business in 2008 to San Luis Obispo and opened their tasting room on Labor Day. Tours of the winery with tasting is offered by appointment and hosted by either Stephen or Paula Dooley on weekends with special releases often available. The tasting room is open weekends at 178 Suburban Road, San Luis Obispo. 805-594-1318. Check out their unique Barrel Adopters program. Wine Preserva This is a simple way to preserve wine. A patented disc is inserted into an open bottle and acts as a barrier against oxidation by floating on the surface of the wine. The producers claim it preserves the aromas and tastes of wine for up to five days. The disc is made from FDA approved food grade material and is recyclable. Six packs sell for $5.99. Wine Preserva can be ordered at www.winehardware.com. I have not used this preservation method so cannot comment on its effectiveness but logically it makes sense. I personally have found pouring left over wine into a half bottle and sealing the half bottle with a used cork works quite well overnight. White wines can be placed in the refrigerator to retard oxidation and they will last a few days. 2009 West Coast Wine Competition The 27th event was held April 22-24, 2009 at Sonoma Mountain Village in Rohnert Park. The competition is produced by Vineyard & Winery Management. The Sweepstakes Red Table Wine was the 2007 Paradise Ridge Winery Russian River Valley Pinot Noir ($35), the Sweepstakes Rosé Wine was the 2008 Fleur De California Vin Gris of Pinot Noir North Coast ($13), the Sweepstakes Sparkling Wine was the 2001 Gloria Ferrar Caves & Vineyards Royal Cuvee Los Carneros ($35) and the Sweepstakes White Table Wine was the 2008 Ventana Vineyards Arroyo Seco Pinot Gris ($18). The complete results are available at www.vwm-online.com. In these competitions I only look at Sweepstakes and Double Gold winners since they represent a consensus of the judging panel and hold more weight. IPNC I was honored to be one of the invited media for this year’s International Pinot Noir Celebration in McMinnville, Oregon. Joining me are a number of outstanding journalists, writers and bloggers including Allen Meadows, John Haeger, Alder Yarrow, David Schildknecht and Jancis Robinson. The 23rd Annual event will be held July 24-26, 2009. Tickets are still available but not for long (www.ipnc.org). Attendance is limited to 700 people. ¡Salud! The Oregon Annual Wine Auction will host a benefit dinner featuring Jancis Robinson, the 2009 IPNC Master of Ceremonies. On Thursday, July 23, the pre-IPNC dinner will be held on Linfield College’s picturesque Withnell Commons lawn. Wines poured will be by Alma Rosa Winery & Vineyards, Elk Cove Vineyards, Fougeray de Beauclair and Westrey Wine Company. The cuisine will be prepared by Chef Benjamin Parks of Ten 01. The event will also feature a silent auction of rare ¡Salud! Pinot Noir cuveés from past vintages. The 18th Annual ¡Salud! Oregon Pinot Noir Auction will be held on Friday and Saturday, November 13 and 14, 2009. Be the first to experience the incredible 2008 vintage Pinot Noirs from Oregon. Visit the website at www.saludauction.org or call 503-681-1850. Men Wine Drinkers Live Longer The Journal of Epidemiology and Community Health reported this month that men who consume light to moderate amounts of any type of alcohol daily gain 2.5 years of life expectancy compared to abstainers. They also have a reduced risk of death from coronary artery disease and other circulatory problems. The study was conducted in the Netherlands and followed 1,373 men for 40 years. 70% of all wine consumed was red suggesting what many other studies have implied, namely, it is the polyphenols in red wine that provide the protective effect on heart health. Confounding factors such as socioeconomic status, diet, and lifestyle were accounted for in the study eliminating their influence on the study’s findings.